So you're familiar with Richard Outcault's Yellow Kid as one of the original newspaper comic strip characters, right? He debuted in Truth magazine #372 in 1894 and quickly moved over to Hogan's Alley strip, published in Joseph Pulitzer's New York World. Outcault was hired away by William Randolph Hearst a year later, but Pulitzer retained the rights to Hogan's Alley. Outcault continued drawing the Yellow Kid, though, in comics of various names for Heart's New York Journal American. The Yellow Kid became immensely popular very quickly, and many people tried to capitalize on that with their own marketing efforts. Mary Wood cites the character appearing on "pins, cigar boxes, sheet music, dolls, cap bombs, postcards, and a number of spin-off variety skits and theater productions." Some of these were officially licensed, some not. One of those pieces I stumbled upon recently was a scan of sheet music. A piece called "The Yellow Kid: The Latest and the Greatest." 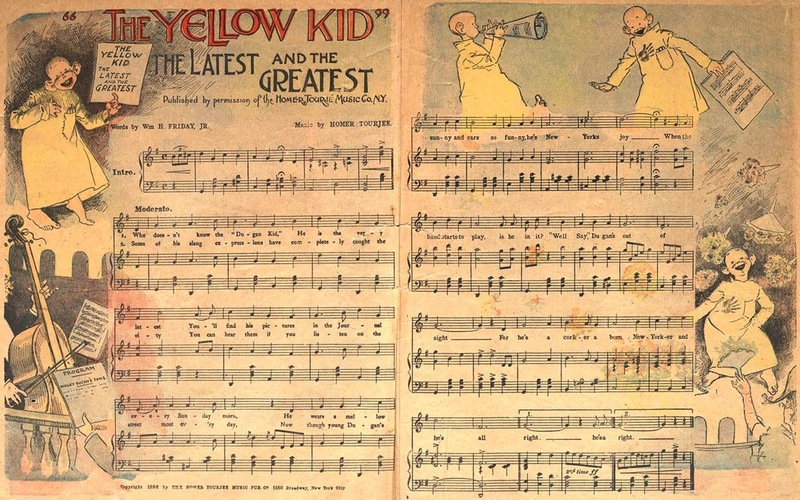 It's adorned with Outcault drawings of the Yellow Kid, evidently done expressly for sheet music, if not this sheet music specifically. The Kid is dancing and singing around the margins, very visibly holding sheet music himself. It strikes me as kind of an odd concept, since the Yellow Kid famously never actually spoke. Anything the character "said" was displayed on his dressing gown. So to provide music to a deliberately mute comic strip comes across as a curious pairing. But I supposed that people have always liked music, and since recordings were unavailable in the 1890s, sheet music was the way to go. Paper was relatively cheap, too, so if you already had a printing press, throwing together something like this would have been an easy way to make a buck, I suppose. The music was written (and published) by Homer Tourjee with words by William Friday, Jr. There's a 1895 copyright on the page, but the lyrical reference to The Journal suggests it was actually 1896. Interestingly, I found another piece of sheet music dated 1896 called "The Dugan Kid Who Lives in Hogan's Alley." It's the exact same music, with slightly altered lyrics. So what I've done is taken the sheet music and transcribed it, note for note, into Garage Band. As I was going through, there were several things that struck me about the piece. It's written pretty simply; almost the entire song is in quarter notes and it's got what I would consider a slow pace. With that, though, there's a time change for the chorus, going from 4/4 to 3/4 and the transition between the two might be described, at best, as awkward. There were also several instances where the notation doesn't make sense -- notes that don't really make chords, rhythms that don't really fit in place, lyrics that don't line up with the music. If you take the piece as it's written, it's not all that good. I eventually found a version of this online where someone had actually arranged it so it sounds half-decent, but that's not what was written. The link below is what I put together, picking up a strictly literal interpretation of what was on the sheet music. I would chalk the poor quality of this song up to the commercialism that allegedly drove Outcault from continuing with the character a couple years later. Recall that this was licensed, composed, written and published within a year of Yellow Kid's debut. It was most likely scribbled down hastily by Tourjee, typeset by someone else who probably had no real musical knowledge and edited quickly, if at all. Any "quirks" you might hear from someone playing would probably be attributed to the pianist and dismissed. The song sounds very much in the style of the late 1800s, but it's almost refreshing to know that the crass commercialism we see in America today isn't entirely new. Who doesn't know the "Dugan Kid"
When the band starts to play, is he in it? When my fur is ruffled, see"
"...the crass commercialism we see in America today isn't entirely new." The marriage between music and the post industrial revolution as well as the mass consumerism it spawned, gave us the beginning of popular culture. The music business in the nineteenth century primarily relied on sheet music and probably traveling vaudeville for a song to become widely known. Throughout this period including the early twentieth century, just prior to Edison's mass produced Gramophone, cylinders, and records, most folks were raised with music lessons of one sort or another, usually classical. A piano was a standard piece of furniture which could be found in most middle class homes along with sheet music.